If you don’t want to or can’t get a job, be a moto driver. That seems to be the motto of Phnom Penh. I couldn’t walk two steps without someone trying to flag me down asking if I want a moto or a tuk tuk. Let’s make a deal here. If I want a ride, I’ll summon you over. Not the other way around. My first experience with the Phnom Penh moto drivers was the second I stepped off the bus at the bus station. One decided that he was going to cling to me, despite my pleas to back off. I told him I needed to call someone (my couchsurfing host) and that I did not need a ride as of now. He took this cue to follow me around and standing so close to me that if I moved I would brush up against him. This is exactly what I did not need after a 4-5 hour bus ride, where my seat did not recline a centimeter (I also had to deal with the guy in front of me who decided to recline his chair all the way giving me about an inch to deal with) and the child behind me kicked my chair the entire time. I ended up not needing his services and had to shoo the man away. My first thoughts when entering the bustling city were once again overwhelming ones. I have a feeling that I tend to get overwhelmed a lot, especially since 1) this is my first time traveling and 2) I’m doing it alone, but I’m proud to say that those feelings do not last long anymore. There seemed to be market stalls galore (there also seemed to be mobile phone shops every other shop), motorcycles inundating the streets creating chaos at every turn, and people everywhere. There were barely any stop lights and if there were, they were ignored. 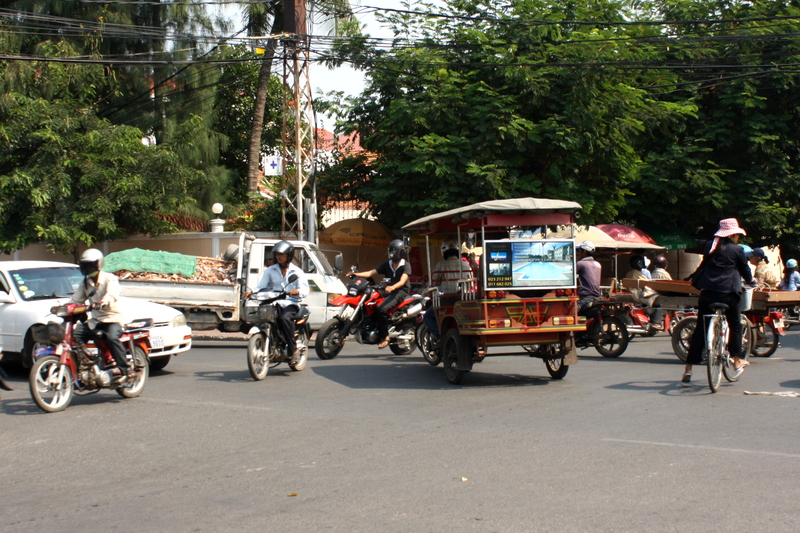 Bicycles, Tuk tuks, Cars and Motorbikes all trying to get through this crazy intersection! Well, this is Southeast Asia, so I guess that’s to be expected, but I had not seen anything like this yet. Intersections were absolute mayhem, with moto drivers, cars, tuk tuks, bicycles and even pedestrians all shooting across at alarming speeds and somehow just missing each other. Moto bikes were somehow made into makeshift trucks (I wish I had pictures of a few of them, but maybe I’ll get one by the end of my trip) and trucks were piled high with cows, fruit, furniture, or people on furniture (I spotted a truck with about a hundred conference style chairs on it with boys sitting in those chairs). Despite the turmoil and sense of urgency on the streets, the city had a laid back vibe and I was eager to become a part of it even if it was for a short while! Hey there!! I had to check into your running blog to see that everything was going well. I noticed you haven’t been able to post as much recently but I will attribute that to less access to the internet in Cambodia. Sounds like you are having a great time. You sure can’t beat places to stay for 4 dollars and 50 cent draft beer. At those rates you might just be able to extend your trip out!! I also get the impression that you are leaving quite the impression on the locals 🙂 I am sure attractive, foreign women traveling alone with a large camera does have the propensity to stick out. Anyways, stay safe and always have your guard up. I will keep reading in jealous fits you are there and I am having to go to bed for work tomorrow. Loving the first impressions series. It’s giving me a real insight into what to expect from the places we’re going to.